Let’s face it; with back to school, kids are always on the go. With schoolwork, practices, tutoring and extracurricular activities, we tend to overlook healthy options and resort to anything fast and easy. An essential part of nutrition is ensuring that we receive a balanced portion of vitamins, minerals, carbohydrates, proteins and fats. Teach your child to love and appreciate healthy food! 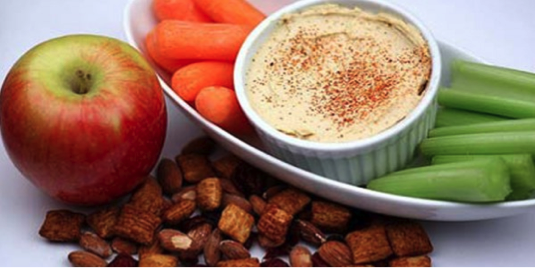 Here are some quick and healthy snack options, that are simple all the while nutritious and delicious. Bon appetit! Kale Chips: Kale is a top source of vitamin K, which is only available from leafy greens, and helps the body repair itself from skinned knees, sprained ankles and other common playground injuries. It’s also a top source of beta carotene and vitamin A. Trail mix; Almonds, peanuts, cashews: includes healthy superfoods, like sunflower seeds (the top source of vitamin E), pumpkin seeds (a top source of iron), nuts (a top source of vitamin E and a good source of omega-3 fatty acids) and raisins (a top source of potassium). Fruits: Oranges, bananas, apples, cherries –– The American Heart Association recommends that kids eat a variety of fruits and vegetables daily, while limiting juice intake. Each meal should contain at least 1 fruit or vegetable. Carrots are the number one source of vitamin A and beta-carotene, two essential nutrients for strong vision and strong immune systems. Carrots are also a top source of lycopene, a disease-fighting phytonutrient. What are some quick and healthy snack options that your kids love? Share in the comment section below.